OFFICE rental rates in Kuala Lumpur are expected to drop by 10% to 15% from their peak of about RM8 per sq ft this year amid the economic slowdown. Although office occupancy rates are still holding up quite well, rental rates are expected to fall from their earlier highs due partly to new office space coming onstream. DTZ Nawawi Tie Leung executive director Brian Koh said that at least a dozen new office buildings, with a total net lettable area of 4.13 million sq ft, would be completed in KL and other parts of the Klang Valley this year. Of these, four – Menara Worldwide, G Tower, Fraser KL and The Icon – are located in KL’s golden triangle, while the rest are in central commercial areas and other decentralised areas such as KL Sentral, Bangsar and Petaling Jaya. Amid uncertainties and fears of a long global economic downturn, occupancy costs are expected to decline in many business districts around the world, led by the contraction in occupier demand. 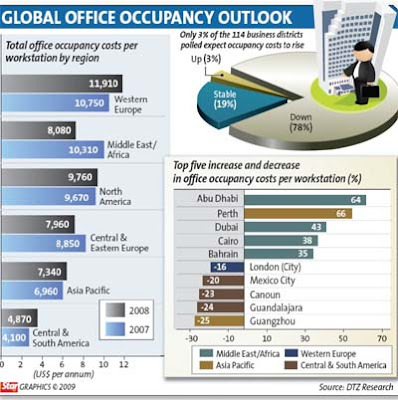 According to DTZ Research’s 2009 global office occupancy costs survey, covering 114 business districts in 49 countries and territories worldwide, the seismic disruption of the global financial system, which started in mid-2008, has wiped out much of the strong growth recorded by many office markets over the past few years. The annual survey looks at the main components of occupancy costs in major office markets across the globe and provides a ranking based on total occupancy costs per workstation. About 78% of the 114 business districts surveyed expect occupancy costs to fall this year, 3% expect a slight increase, and the balance 19% expect costs to remain stable. Only the Middle East and Africa regions, and central and eastern Europe registered positive annual growth in office occupancy costs of 28% and 11% over the previous year, while other regions witnessed declines in costs. All business districts surveyed in western, central and eastern Europe, and central and south America expect occupancy costs to fall this year. In North America, occupancy costs are expected to remain stable in 61% of the business districts surveyed, while a further 39% – comprising mainly the largest business districts at the heart of the financial turmoil – are predicted to experience a significant decline in occupancy costs. About 76% of the markets surveyed in the Asia-Pacific expect office occupancy costs to fall and 24% see costs remaining stable over the year. In the Middle East and Africa regions, 30% of the respondents expect some increase in occupancy costs, while the rest expect costs to fall throughout this year. DTZ said the prospects of an impending supply glut in some markets and the wider adoption of flexible work practices leading to reduced space consumption would help drive down occupancy costs, especially across Europe and the Asia-Pacific region. Space utilisation standards across most regions are expected to decline as companies focus on space optimisation and cost reduction measures. Meanwhile, new, better-designed offices with larger floor plates and fewer columns will gradually contribute to greater efficiency in space layout. In terms of rents and other outgoings per sq ft, Moscow, Hong Kong and London (West End) are the top three most expensive office locations in 2009. However, due to a higher space utilisation standard per workstation, Tokyo (Central 5 wards) was the world’s most expensive office location on a cost per workstation basis. Its space utilisation per workstation was 144 sq ft compared with Moscow’s 84 sq ft, Hong Kong’s 118 sq ft and West End London’s 118 sq ft.
Tokyo (Central 5 wards) has overtaken London (West End) as the most expensive office location on a cost per workstation basis. London (West End), which had been the most expensive office market on this basis since 2001 when DTZ first compiled such rankings, was ranked fifth. OSK Property Holdings Bhd plans to build an office tower in the heart of Kuala Lumpur to capture rising demand for office space in the city centre. The 40-storey building, which will cost RM150 million, will sit on 0.6ha of prime land, located between Plaza OSK and Ampang Park mall at Jalan Ampang. Currently, the Royal China Taitong Restaurant is occupying the area, said executive director and chief operating officer Gerard Tan Boon Chuan. Construction will start after it gets the approvals and when the restaurant's lease expires in 2012. The tower is expected to be finished by early 2015 and it will be connected to Plaza OSK, which houses Bank of China and RHB Bank, with a sky bridge. "We expect it to be a full-fledged financial centre," he told Business Times in an interview in Kuala Lumpur recently. The 23-storey Plaza OSK, built in the early 1980s, and the land, are owned by OSK Holdings Bhd, a financial group with operations in investment banking, wealth management, venture capital and retail services. Separately, OSK Property is also planning office towers in Kampung Baru. As it has only 0.15ha in the area, it will partner other land owners for the project, Tan said. "We are mulling over the best concept and design to build. We were in serious talks with land owners," Tan said. This year, the company is aiming for RM200 million in property sales from its five existing projects in the Klang Valley, Kedah and Negri Sembilan. For the year to December 31 2008, it launched RM180 million worth of properties and recorded sales of RM153 million. To achieve the target, OSK Property will use different strategies for each product and location. It has also launched a month-long Home Free Plus campaign where buyers pay 5 per cent down payment for a property, with zero per cent interest during construction. OSK Property Holdings Bhd, a property developer, will launch a few projects this year, mostly comprising new phases of existing developments. It targets to launch phase two of Sutera Damansara, a 40ha gated development in Damansara Damai, Selangor, next month or in June. There will be 200 terraced houses on offer, worth a combined RM120 million, or about RM500,000 each, executive director and chief operating officer Gerard Tan Boon Chuan said. OSK Property is confident of sales and is targeting first-time buyers. The first phase has 149 terraced houses, worth more than RM460,000 each, for sale. Launched five months ago, 110 units have been sold. Tan told Business Times in an interview that Sutera Damansara has been projected to rake in RM1 billion in gross development value (GDV). Its initial target was RM600 million to RM800 million. "While raw materials are cheaper, we are adding more features and products," he said. In total, Sutera Damansara will have 2,000 units of two- and three-storey terraced and two- and three-storey semi-detached houses, medium- and high-rise apartments, and a small tract of commercial centre. The project is being developed over seven years. In Seremban, OSK Property is launching phase two of Mont Jade, a 22ha gated community built around an Australian concept, next month or in June. It will offer 54 semi-detached homes worth RM26 million. The final phase, slated for launch by year-end or early next year, will feature more than 100 bungalows and bungalow lots worth RM120 million. OSK Property is also launching Bangi lakehill villas, an exclusive 4.8ha niche gated development in Bandar Baru Bangi, in the third quarter. The project will feature 74 units of two- and three-storey semi-detached houses, priced from RM1 million each, or worth around RM80 million in total. Tan said the company was on the lookout for land in the Klang Valley, instead of Kedah or Negri Sembilan, as profits were higher. Kuala Lumpur is on the shopping list of luxury brands in the likes of Four Seasons, St Regis and now Raffles - a welcome move for Malaysia to rid itself of the cheap destination tag. The presence of these regal brands will help raise Malaysia's profile, improve service standards and room rates. With the exception of possibly Langkawi, Malaysia is touted to have one of the world's lowest hotel room rates. As market leaders, these prestigious hotels position themselves at a certain level which enables other hotels to follow suit and lift the bar for hotel rates. 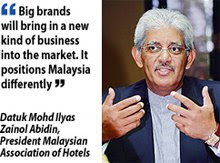 "They help push room rates higher, which will be difficult to do without them ... and they help improve yield," Malaysian Association of Hotels (MAH) president Datuk Mohd Ilyas Zainol Abidin told Business Times. Four Seasons Resort Langkawi's presence on the island, Mohd Ilyas said, helped to set a standard and boost the average room rate (ARR) of hotels there. IIyas reckons that rates could be hiked by at least a quarter compared with current rates by five-star hotels of around US$120 (RM434) per night. This provides the opportunity for other hotels to up their rates by between 10 per cent and 15 per cent. Based on the hotel data from MIHR Consulting Sdn Bhd, Kuala Lumpur's rate leader is Mandarin Oriental, with an ARR of over RM600. Almost all other five-star hotels are below RM500 per night. It has been a tough journey for Malaysian hoteliers since the 1997 crisis, as it took them seven years to start raising rates to current levels. Hotels here are adopting a slightly different approach this global crisis, they do not plan to cut rates. Once rates fall, it is hard to raise them. Instead, rates are maintained by value adding. Perks like breakfast, free Internet service, drop-offs and pick-ups are thrown in. Mohd Ilyas added that big brands in Malaysia will bring in a new kind of business into the market. "It positions Malaysia differently," he said. Service will be at par with the premium they charge and the people employed are of a different caliber, he said. Developer of Four Seasons Place in Kuala Lumpur Tan Sri Syed Yusof Syed Nasir is looking to net a 30 per cent higher ARR than the city-wide ARR when it opens in 2012. "Four Seasons is a rate leader, the rate could be about RM800 per night," said Syed Yusof, who is chairman of Venus Assets Sdn Bhd, the hotel developer. Meanwhile, the 200-room St. Regis Kuala Lumpur, a Starwood Hotels & Resorts brand, is expected to open at KL Sentral in 2014. The owner, One IFC Sdn Bhd, were quoted as saying that it believes Kuala Lumpur is ready for the luxury brand. As for Raffles Hotels & Resorts, sources say that its opening could be as early as 2011. And what other high-end hotel brands will Malaysia like to welcome? Mohd Ilyas would love to see brands like Amanresorts, Banyan Tree and Bvlgari Hotels and Resorts as they cater to niche markets. Raffles Hotels to open doors in KL in 2011? MALAYSIA will have a royal treat as the prestigious Raffles Hotels and Resorts - a brand linked to Prince Alwaleed Bin Talal Bin Abdulaziz Alsaud - looks to Malaysia to expand. The luxury brand hotel may have a presence in Malaysia, at the RM3 billion integrated Pavilion Kuala Lumpur development in Bukit Bintang, as early as 2011, sources say. Raffles, owned by Toronto-based Fairmont Raffles Hotels International (FRHI), is now in discussions with relevant parties for the possible opening. FRHI is run by Kingdom Hotels International, a company controlled by the Saudi prince. The former also runs some 91 hotels under the Raffles, Fairmont and Swissotel brands. When contacted, a Raffles spokesman confirmed talk that it plans to open in Malaysia and possibly in the Bukit Bintang area. "Discussions have yet to be finalised and it would be premature for us to enter into specifics at this time," he said in an e-mailed response. The spokesman said Raffles, formed in 1989 to restore, redevelop and manage the world-famous Raffles Hotel, Singapore, has a long-term aim of growing its footprint in urban and resort destinations that are sought after by travellers. "As such, we consistently explore suitable opportunities in capital cities and prominent leisure markets such as Kuala Lumpur, to further this goal," he added. Pavilion KL acting chief executive officer Joyce Yap neither denied nor confirmed that it is in talks with Raffles. "We do have a proposed hotel (within the Pavilion development) and we are definitely interested in a luxury hotel," Yap said. On the earliest possible date at which its hotel component will be ready, Yap said: "Two years from now." Located at Bukit Bintang - the popular shopping zone within the Golden Triangle - Pavilion KL has allocated some 250,000 sq ft of space for its hotel component with close to 200 rooms. Pavilion also houses 2.26 million sq ft of retail, 223,000 sq ft of corporate office and 1.2 million sq ft of residences. It is 51 per cent owned by Urusharta Cemerlang Sdn Bhd and 49 per cent owned by the Qatar Investment Authority. PKNS Engineering & Construction Bhd (PECB) is cautiously optimistic its serviced apartments in Shah Alam will be fully taken up by year’s end. General manager Mohd Sufian Hashim said response to the Mutiara Anggerik apartments in Section 15, Shah Alam had been encouraging since they were launched on April 1. “More than 50 units have been taken up so far. Because of the current downturn, it is actually difficult to say, but we hope to achieve full sales by the year-end or early next year,” he told StarBiz on the sidelines of a media presentation on Mutiara Anggerik on Saturday. The project’s strategic location and easy access made it appealing to would-be buyers and investors, he said, adding that the company would be offering various incentives and promotions throughout the month to attract more buyers. Construction of Mutiara Anggerik, a project comprising three 15-storey blocks of 116 units each and which has a gross development value of RM100mil, is expected to be completed in 18 months. Blocks A (1,493 sq ft), B (1,188 sq ft) and C (1,057 sq ft) have starting prices of RM362,400, RM281,100 and RM250,000 respectively. Sufian said PECB was targeting the middle to high-end income group for the serviced apartments. “We are targeting mainly customers from Shah Alam but, because of its strategic location, we also expect customers from Kuala Lumpur and as far as the Port Klang area,” he said. Sufian said PECB was looking at some strategic locations in the Klang Valley for its next project on completion of Mutiara Anggerik. The newly formed Cabinet is expected to expedite the roll-out of construction projects under the stimulus packages and the Ninth Malaysia Plan. IJM Corp Bhd CEO Datuk Krishnan Tan told a news wire service on Friday he was positive the new government would push forward the implementation of the fiscal stimulus packages. There are grounds for optimism in the rising supply of deals coming on stream. In view of the improved construction sector outlook, IJM intended to focus on its home turf, instead of in the Middle East and India, he added. Fund managers share his optimism. Their buying support enabled IJM’s share price to gain 54% this year to RM4.64 on Friday, one of the best performing big cap stocks. That is a partial but significant recovery from IJM’s high of RM8.25 last year. As fund managers glimpse a light at the end of the smart tunnel, they have been buying up construction stocks, principally the Big Three – Gamuda Bhd, IJM and WCT Bhd. This interest has also extended to the stocks of companies that manufacture building materials. In particular, fund managers poured into Lafarge Malayan Cement Bhd, the biggest player in the industry, leading it to rise to RM4.40, close to its 52-week high of RM4.76. The company is highly profitable, earning a net profit of RM119mil in just one quarter (Oct-Dec 2008). That helped Lafarge to rise to a total market value of RM3.7bil. 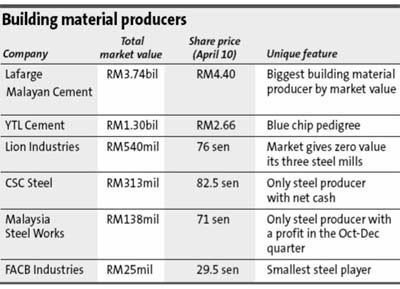 Interestingly, as the biggest cement company, its market value is more than five times that of the biggest steel company, Southern Steel Bhd (RM680mil). Lafarge commands a valuation premium in the industry, which is common for the biggest player in a sector. Hence, its share price exceeds that of YTL Cement Bhd (RM2.66) which is a sizeable number two in the industry. The premium of Lafarge is all the more larger as YTL Cement’s earnings estimate is 55 sen a share for its financial year ending June 30 as against Lafarge’s 37 sen for the year ending Dec 31, according to consensus compiled by Bloomberg. This is not a spot that YTL is used to. Group holding company YTL Corp Bhd is itself near its 52-week high of RM7.60 as the stock closed at RM7.15 on Friday. In contrast, YTL Cement is far from its 52-week high of RM4.80. While the profitability of cement producers is buoyant, that of steel producers sank into heavy losses, mainly inventory losses, in the Oct-Dec quarter. It helps the cement producers that their main raw material – limestone – is mined locally at a time of volatile prices for natural resources in the global market. Eventually, the steel producers will make profits again, but in the meantime, their market values have been bashed down with, sometimes plunging further than, their losses. In the case of Lion Industries Corp Bhd, the market accords no value to its four steel mills at Bukit Raja, Banting (both in Klang), Pasir Gudang and Labuan. Lion Industries has a market value of RM540mil and borrowings of about RM1.5bil which are less than the combination of its shares and convertible loan stocks in Parkson Holdings Bhd that are worth over RM1.3bil, its cash of RM600mil and steel inventories of RM440mil. On paper, investors in Lion Industries are getting its steel mills free. Alternatively viewed, it could repay all its borrowings if it sells its Parkson shares. That can be done with the Lion group’s chief Tan Sri William Cheng maintaining his reins over Parkson in which he holds a major direct stake. CSC Steel Holdings Bhd is a smaller steel milling company but its parent is the very large China Steel Corp of Taiwan. Although CSC also incurred inventory losses the Oct-Dec quarter, it held net cash of over RM160mil. This too will be a company that will survive to benefit in the recovery cycle that will come sometime in the future. Malaysia Steel Works Bhd, a unit of the Soon Seng group, is another depressed steel stock which traded at 71 sen or about a third of its net assets. While investors fretted over potential losses, the company has been consistently profitable over the last five years, including the Oct-Dec quarter last year when the rest of the industry was in the red. In that quarter, it earned a net profit of RM5.5mil. Stainless steel FACB Industries Bhd is the smallest in the industry after its share price fell to 29.5 sen, giving it a market value of just RM25mil, an unlikely figure for a steel company. It suffered a large loss of RM41mil in the Oct-Dec quarter but that was almost entirely due to inventory losses. Building materials are in a cyclical sector but as the Government’s stimulus spending accelerates, the worst should be over in this industry. The industry’s step-up to the next stage of its cycle will, of course, depend on the strength of the economic recovery.